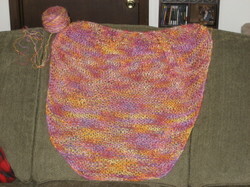 I spent a little time with the Spring Enticement Shawl on Monday. Here is an almost current view as well as what the yarn cake looks like after one of my cats (yet to be determined) did some treasure hunting. The yarn draws fairly well so I'm not going to try to rewind the cake unless there is a major snarl. Believe it or not, this needle punch project was purchased and started in mid-2007, if not earlier. 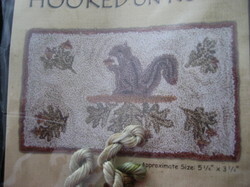 I guess I had a think for squirrels then and didn't recognize it. Not really. 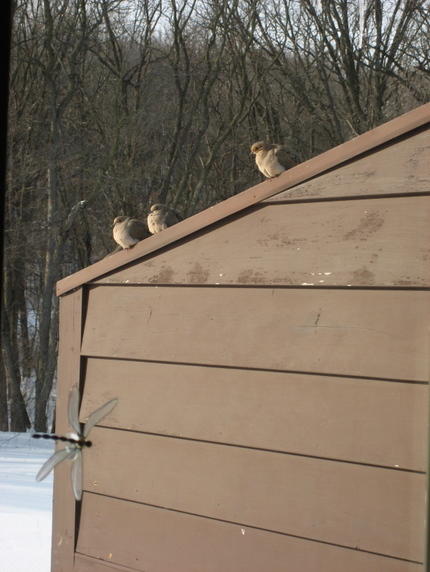 Actually, I share a love of oaks with the furry little rodents animals so they are constantly part of my environment. Here is what the project will look like. and here is the side that will be the finished side. 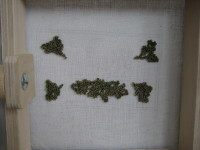 I'm using a frame that is sort of a mini rug hooking frame that sits in my lap. That way, I don't have to hold the embroidery hoop while I punch the fabric. It holds the fabric taut, which is important, and my arm doesn't get tense from holding my hand closed around the hoop for a long period of time. I also find that I don't stab myself at all with this frame.....previously, stabbing was a very likely occurrence. I've filled in a bit more than is pictured here but not enough to warrant another photo. Thanks for the nudge, Stacey. Now, I have more blog material. Knitting content ahead. Consider yourself warned. I actually have a bit of knitting content to post today so brace yourself. I've finished Jaywalker sock number one. Although this photo shows an open toe, I did finish it Sunday evening and was just too tired the lighting was poor, so I didn't take an updated photo. 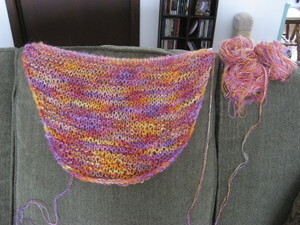 I've also been working on the Spring Enticement Shawl. It is a tad bit larger now than this photo but once again, the light was better earlier Sunday afternoon than later in the evening. 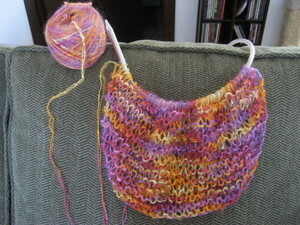 *g* Besides, a shawl blob is still a blob, lace pattern or no. 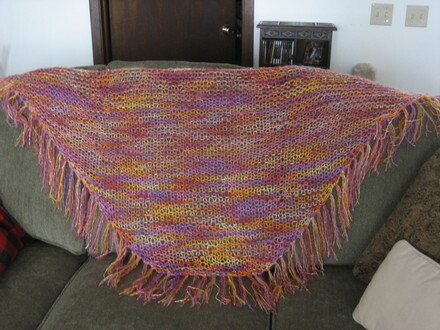 The pattern is the Famous Shawl from Fiesta Yarns and the yarn is La Boheme also from Fiesta Yarns, a combination of one strand of mohair and one strand of rayon. This yarn has been in my stash for a number of years....at least a year before we moved and that was almost three years ago. How's that for true confessions?! The pattern is quite simple and provides a showcase for the color and texture of the yarn. This photo was also taken before one of the cats decided the nice cake of yarn was hiding a secret. I'm hoping no knots developed during the search for treasure. That's what I get for leaving temptation in plain sight! The driveway drifts were plowed Sunday but the wind was still moving snow. The drifts looked like they came up to the hood of the truck that plowed us out. Snow was flying everywhere and it took some effort to clear the long driveway. Yikes! I'm posting this in advance so we'll see if the driveway is passable Monday morning. Drive safe everybody and dress warm! Happy Birthday, Mom! DH and I joined Mom earlier this week for dinner and celebrated her birthday two days early. She cooked and it was a yummy dinner for us after work. DH with my assistance as kitchen flunky will be preparing dinner for a few folks at a future date. This weekend, however, she is winging her way to California to visit with my brother and his family. She will be escaping the snow and ultra-cold temperature coming our way. Thank goodness! Happy Birthday to a super mother. I love you! Speaking of mountains of snow and ultra-cold weather.....I think I've succumbed. The white and ice and lack of sun have done me in. The evidence? I came home after a week on the road and I cleaned the refrigerator. I didn't grab a beverage. I didn't check my bloglines. I cleaned the refrigerator. Now, it definitely needed cleaning and I probably saved the surrounding community from the ricotta cheese that was about to wreck havoc but never in my life have I cleaned the 'frig on a Friday night. The only explanation I can come up with is that the weather has made me crazy. Of course, some people may be helping me down the road to the nut house. Nuts? hmmm. 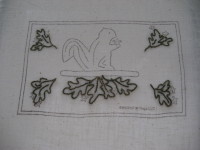 Squirrels! More on that tomorrow. 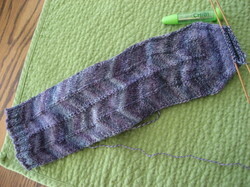 The Spring Enticement Shawl is having a bit of difficulty. The mohair strand that is supposed to accompany the rayon strand in the yarn broke and is lagging about a yard behind. I am pondering whether to cut out the rayon or to pull up the mohair to match the color sequence. I think cutting out the rayon may be the answer. I just hate that there is a break. I'm afraid my current mood may dictate other odd actions.